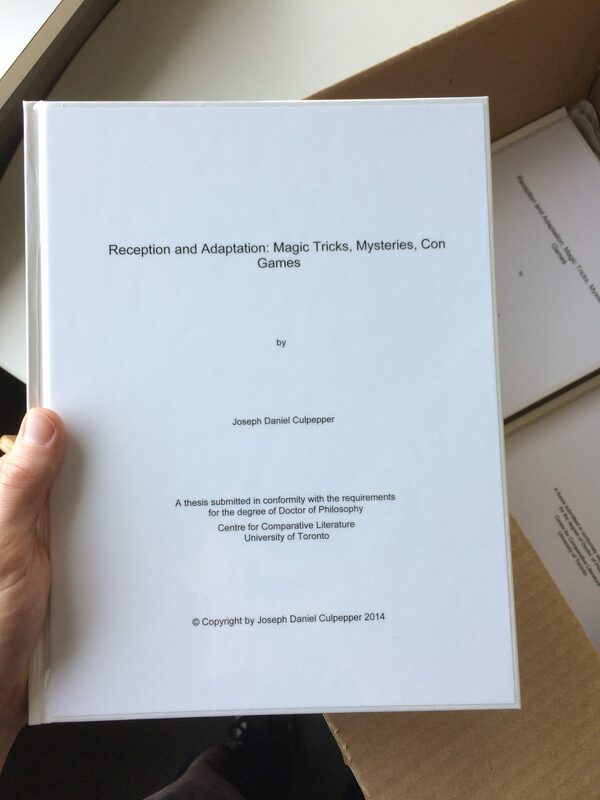 It’s strange, but there are actually people out there who collect dissertations on magic. I’m excited to present a talk tomorrow afternoon called “Doctoring Magic” for the attendees of the 44th annual Magic Collectors Weekend (MCW). As you can see above, I’ll have 52 signed and numbered copies for purchase by those who want them after my presentation. I would like to thank Magicana and the McCord Museum for bringing so many magic historians, performers and collectors to Montréal this weekend. We are all here to appreciate the beauty and wonder of the Allan Slaight collection of Golden Age lithographs that are part of the McCord’s Illusions exhibition. Thanks to the generosity of La Fondation Emmanuelle Gattuso, Montreal has a new world class magic collection that will increase and nurture magic scholarship in this city for many years to come. The 52 copies of my dissertation that I’ve printed for this event will be sold for $45 USD ($60 CAD). Those who purchase one and add their names to my email list will receive a text-searchable PDF version of the dissertation for free. If you requested a copy years ago and will be present tomorrow, please email me a reminder and I’ll ensure that one is set aside for you. Now, back to the magic history research!